CARTAGENA DE INDIAS, Colombia, Jan 25 2013 (IPS) - An ambitious programme of infrastructure works to overcome the risks of climate change in Cartagena de Indias, a city on the Caribbean coast in northern Colombia, has generated controversy, with authorities predicting benefits while parts of the affected population voice criticisms. 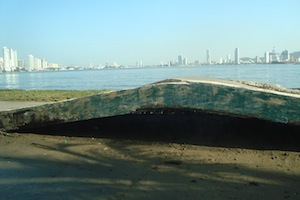 Plans for adapting to climate change in Cartagena were first outlined back in 2004, and continue to advance in spite of the voices raised in protest. While the authorities applaud the plans, many local people have their doubts. What both sides have in common is their joint interest in reducing the negative effects of climate change, which is causing an estimated rise in sea level of two to five millimetres a year. Experts calculate that coastal waters in Cartagena de Indias have risen between 15 and 22 centimetres over the past 100 years, and by 2100 will rise another 80 cm or even one metre. “The changes happened most suddenly eight years ago, when there were heavier rains, larger swells, recurrent hurricanes, flooding and heat waves, with consequent environmental changes,” marine biologist Francisco Castillo, an adviser to the Planning Secretariat of Cartagena de Indias, told IPS. 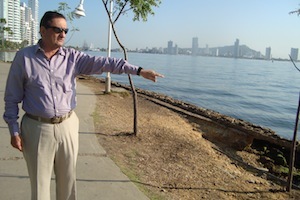 Originally titled “Integrating climate change adaptation into city planning in Cartagena de Indias”, the plan has the support of the local government and is coordinated by the Ministry of Environment, Housing and Territorial Development, the Institute of Marine and Coastal Research (INVEMAR) and the Climate and Development Knowledge Network (CDKN), an international alliance of organisations. Construction projects to protect the city from the vagaries of the weather include nine sea walls, five breakwaters and two flood barriers, several of which are already being built. But the most impressive and significant venture is the widening of Santander Avenue, which crosses the city, and the installation of a main underwater outlet pipeline, which will replace 30 wastewater pipes that are presently in use. Capital of the northern province of Bolívar, Cartagena is home to nearly one million people in an area of 709 square kilometres. It has a 48.7-kilometre coastline on the Caribbean Sea and its economy is based on the chemical industry, trade, free zones and especially tourism. The wide range of hotels; the contrast between the colonial centre, with its defensive wall, and the modern city with its high-rises; and its evocation by renowned artists like writer Gabriel García Márquez and painter Alejandro Obregón, are some of the elements that make this city a prime attraction for thousands of domestic and foreign tourists. But its aura as an international tourist centre partly hides the city’s stark social and economic disparities. The dire poverty of a considerable proportion of the people stands in shocking contrast to the wealthy minority, who indulge in a highly consumerist lifestyle. “The project’s construction and operating stages will create jobs for the low-income population, providing a better quality of life,” said Castillo. Workers are needed now for these climate adaptation projects. In many cases, the jobs will go to fisherfolk, who will be trained in construction work and paid a steady wage, in principle for four years, providing them with greater security than artisanal fishing can guarantee. The contradictions between labour security and environmental issues are highly visible in the village of Punta Canoa, 21 kilometres from the urban centre of Cartagena, the planned terminal of the underwater outfall pipeline carrying the city’s wastewater. “For seven years, most of us have protested, because we didn’t want the outlet pipeline to be installed here, and I still feel the same way,” Ramiro Ramírez, a 54-year-old fisherman, told IPS at his home in Punta Canoa. “I protest because I know the sea, and I know that the currents will bring faecal matter back onshore. The smell is already unbearable. But many people, who at one time even got violent with the workers of ACUACAR (Cartagena Water), now have a job, or one of the 12 fishing boats they gave away. No one is saying a word now,” Ramírez complained. Two fisherfolk about to push out to sea in a boat fitted with an outboard engine also refused to comment. The underwater outlet pipeline is part of the Master Plan for Water and Sewerage for Cartagena that was begun in 1996 but, owing to its importance and effects, was included in the climate change adaptation plan to ensure its execution. The pipe has a diameter of two metres and is 4.3 kilometres long, running under the sea bed for 2.6 kilometres, according to ACUACAR. 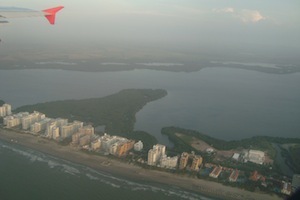 The pipe is expected to benefit the population surrounding the Ciénaga de La Virgen, a lake and mangrove swamp that used to receive 60 percent of the city’s wastewater, causing massive fish die-offs until 2000, when the La Bocana channel was dug to let seawater in daily to renew the lake water. In Ramírez’s view, “There is nothing to be done, because there is no dialogue with the authorities.” He described his concern about the waste: “It will not be unsightly. But it will be muck treated with chemicals that will harm” fish populations, he said. “And we will also have skin problems, because hospital waste will also be pumped out here, as well as waste from almost 30 smaller outlet pipes in Cartagena,” Ramírez said sadly, glancing at his three-year-old grandson who will likely bear the lion’s share of this environmental pollution in the years to come. Ramírez is partly right, according to Castillo. “Wastewater treatment is not being done in primary, secondary and tertiary stages, as would be the ideal; but pre-treated material is being expelled 1.8 kilometres away, where it is dispersed and neutralised by the temperature and salinity of the sea. For now, ACUACAR is sending waste into the sea for the seawater to biologically finish off the treatment,” he said. “ACUACAR has a fixed deadline to finalise the complete process,” Castillo said. 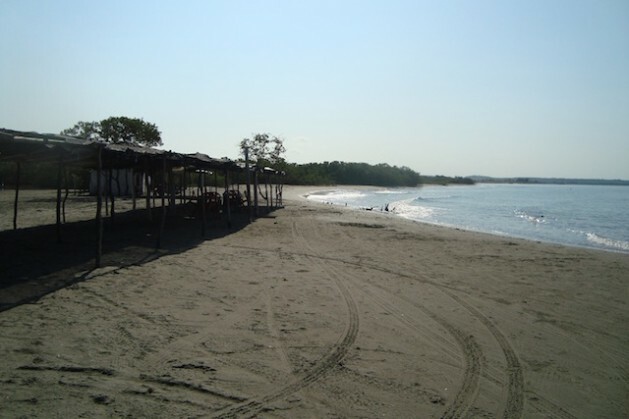 “I dream of what Cartagena will be like in 2015, with the outfall pipeline fully operational, a coastal protection system in place, a completely unpolluted Ciénaga de La Virgen, and all the fabulous beaches in tiptop condition,” he concluded enthusiastically.